I’ve given myself since Friday to comment on the new Twentieth Century Fox and Walden Media film adaptation of C. S. Lewis’, The Voyage of the Dawn Treader. Time’s up. Enough has been said about a number failings and justifications about the film adaptation. Yes, we are grateful for those at Walden Media who’ve worked hard to preserve Lewis’ intended Christian imagery. Yes, we know the story is episodic and that each island adventure makes for cumbersome movie making. Yes, Reepicheep is as winsome as Eustace is ‘scrubbish’ — both were commendable, though I think Eustace more. And Yes, we know that concessions, negotiations, adaptations must occur when you take a 200 pages story and turn it into a two hour movie. And before I rant (for rant I will) I have not met anyone who did not come away with a favorable, first impression of the movie; this tells me that as it stands as a movie alone, Dawn Treader isn’t that bad. Here’s an episodic list of charges against the lumbering old Leopard. Firstly, if Warner Brothers had done to Harry Potter what Disney/Fox has done to Narnia, movie theaters would’ve been torn down and set ablaze with their own popcorn butter. I wonder if the Duffers had a hand in writing this screenplay. Really? I mean, Really? I half-expected Edmund to have thought the Stay Puff Marshmallow Man into existence (ala Ghostbusters) while at the Dark Island. And speaking of the Dark Island, it’s supposed to be DARK not MOSTLY dark. And what’s with this Green Smoke Monster, evil-thing-which-is-never-named? I was ready to discover that Locke had made if off THE Island into Narnia and had shacked up with the White Witch. I don’t want a Morlistic, Therapeutic Aslan. In the book, Aslan is not a nurturing and consoling therapist, he is LIGHT. He appears and people are transformed. Each character is not merely encouraged to resist temptation, but when they are in the presence of Aslan, temptation gives way to sanity, soundness, and peace of mind. The proud become humble, the superior become servants, the fearful take heart, and the blinded see as his “sword of light hurts and humbles”. Aslan is heavy-light, and Lewis intended that light to banish darkness, not manage it. The scenes in which people are encouraged or exhorted, come across preachy or worse, pathetic. It left out the most important character. It’s the DAWN Treader. Where was the sun? Where was light? The LIGHT is so vitally influential in all that happens in Lewis’ Dawn Treader. This mistake marks a failed opportunity of cinematography. So much more beauty and dread could’ve been communicated without having to tell us everything. The photo above captures the only apparent acknowledgement to the sun and the land of the sun’s rising in the movie. 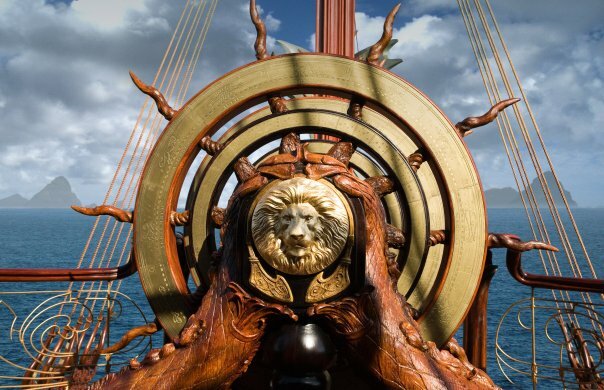 Lastly, the Dawn Treader need not be episodic if one sees the story about transformation. The characters change as they come under LIGHT’s greater influence. If the story is about the Alchemist, Aslan, as he transform’s the character of each through the journey–then the story has an arc which is understandable and not clunky and even beautiful as each takes their proper station as knight, friend, woman, man…. And, even if Aslan were not central, they could’ve employed Reepicheep’s quest to fulfill the prophecy about him as the central arc of the story. By all accounts, Simon Pegg’s Reepicheep stole the show. If they would’ve left off the swords and the green smoke monster and explored Reep’s history–it could’ve been so much better. And speaking of swords, Did I say that THE sword in Dawn Treader is LIGHT? Let me leave you with Lewis’ words from his poem, “The Planets” regarding Sol (the sun) because this is what the Dawn Treader is about. Lastly, lastly, Thank you, Michael Ward for helping me delight in Lewis.